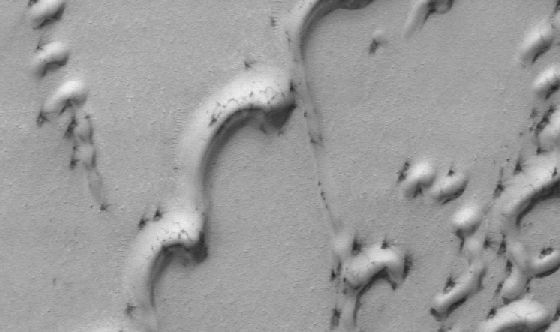 Opis: Wind erosion has been discovered on Mars. Pictures of regions surrounding the north polar cap show sand dunes covered in frost. In places, however, this frost has been eroded to uncover the dark sand underneath. Since this frost can only be as old as the Martian winter is long, this erosion must have taken place within the past Martian year. Once established, it is easy to visualize that much of the appearance of the above region has been sculpted by wind blown dust. Because the Martian atmosphere is so thin, a person standing on Mars would not get blown over by these Martian winds.